A video, where former President Mahinda Rajapaksa publicly ridiculing his own Media Secretary Udith Lokubandara, the son of former Speaker W.J.M. Lokubandara, went viral in the social media during the weekend. 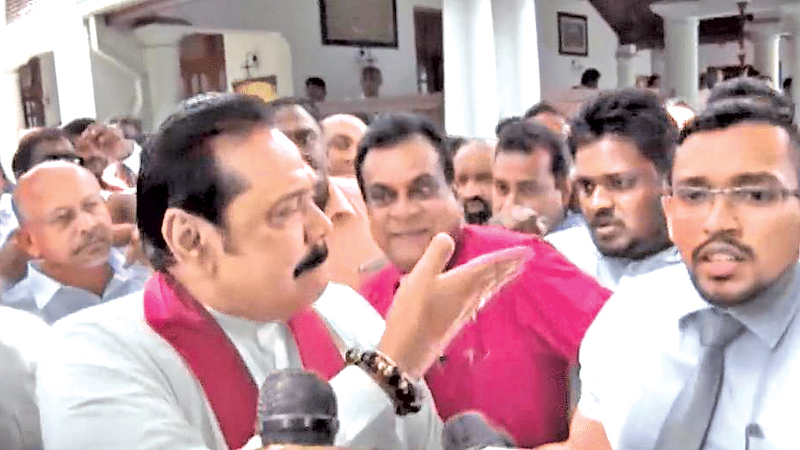 Former President Rajapaksa was seen yelling at former MP Udith Lokubandara calling him a moda yakek in the presence of several TV cameras and media personnel. This incident was soon after the CID recorded a statement from the former President over the kidnap probe of senior journalist Keith Noyahr last Friday at the former President’s residence in Wijerama Mawatha, Colombo 7. A crowd supporting Rajapaksa and media personnel had gathered at the premisespressed around the former President as he walked out after nearly three hours’ interrogation. The video, which was making rounds in the social media, shows that the seemingly miffed former President was slightly pushing Lokubandara back in to the crowd with angry remarks, Me anna arehata vela inna. Lokubandara was seen shocked by the unexpected comment. The social media was abuzz over the weekend over how the former President publicly humiliated his own loyal official. The post had been shared by many on Twitter and Facebook earning a large number of comments. Following the incident, the former President gave a “voice cut” to the media over the CID interrogation. He told the media that he cannot remember whether he received calls urging his intervention to save the life of Keith Noyahr.